A woman experiences the suffering of her parents due to some unnamed event perhaps a war. 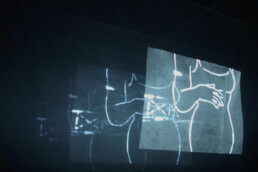 The animation is based on an instinctive line about how a woman’s body carries a narrative. The veils suggests the many veils a woman puts on in her lifetime. 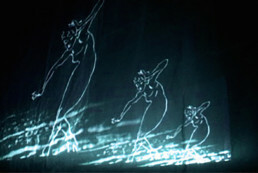 In addition the transparent veils reflect the many levels an animator works with while studying movement. Il mio padre stave soffrendo. To go out to see my father. Saying, your father is suffering. And it was true my father was suffering.